This morning while I was working in the garden cleaning the birdbath and watering the vegetables, my daughter sent me a link to an article by one of our favorite food people: Martha Rose Shulman. Shulman is a food columnist for the New York Times, and my daughter and I have read, cooked, and loved her “Recipes for Health” for years. In this warm, loving article, “A Stepmother’s Legacy, in Meals Made with Love,” Shulman pays tribute to her stepmother “Mumsie,” who instilled in her the love of cooking good food. 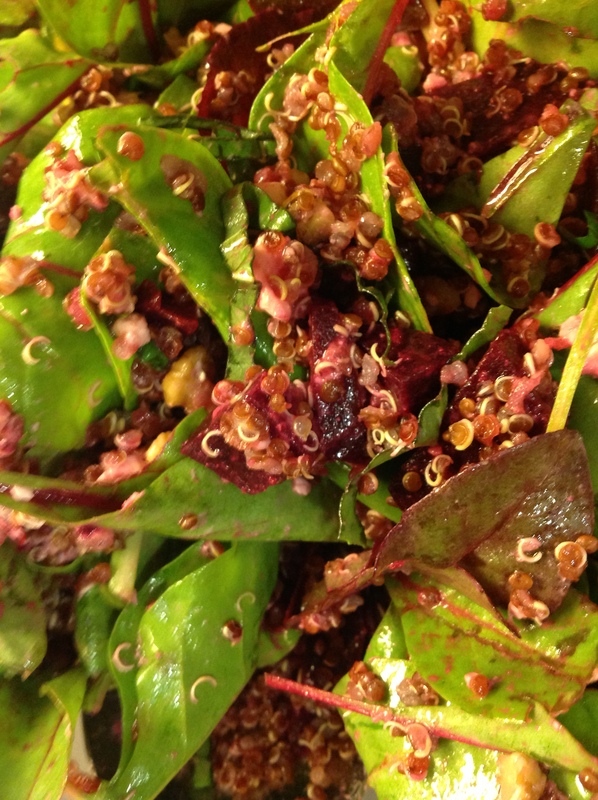 So, in honor of Martha Rose and Mumsie, let us indulge ourselves in a spin-off of one of the Recipes for Good Health that’s beautiful for spring beets and greens and provides protein in the form of the superfood known as quinoa (pronounced keen-wah). Quinoa is a gluten-free, high-protein relative of beets and spinach from the Andean region. Listen: How about some cool funk with Rickie Lee Jones? While roasting beets fill the kitchen with their rich, sweet aroma, you can groove through the prep, perhaps re-living your high school days with Jones’ 1979 “Chuck E’s in Love.” If you like that, keep adding to the playlist: “Comes Love” (live) duet with Willie Nelson from Willie’s album with the great title, Outlaws and Angels; her covers of “Someone to Watch over Me” and “The Low Spark of High-Heeled Boys” or others off her 2000 album This Is It. Sip: If you’re using local, seasonal ingredients and it’s springtime for beets, it may be chilly outside, so you could lean toward an earthy, interesting Pinot Noir. If you’re dining al fresco, however, on a balmier evening, I’d recommend a buttery Chardonnay. 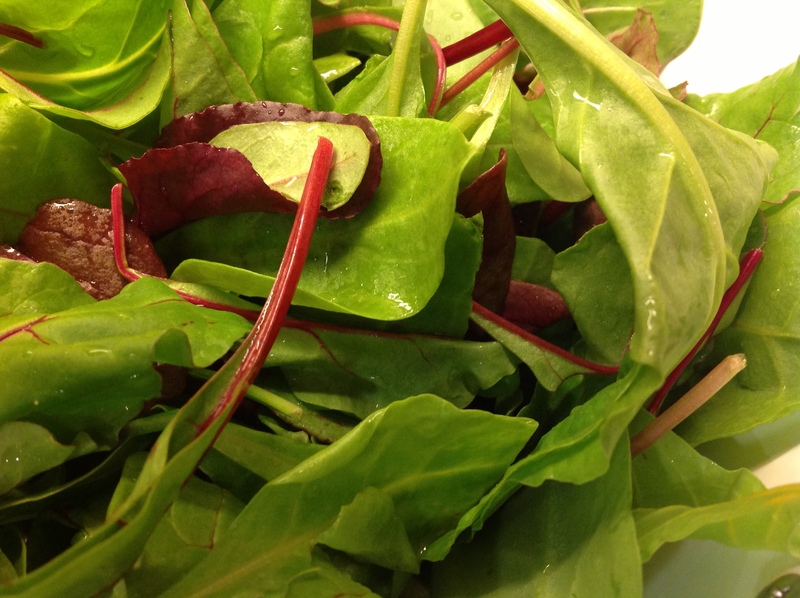 Baby chard is an excellent green for this recipe, as is spinach. 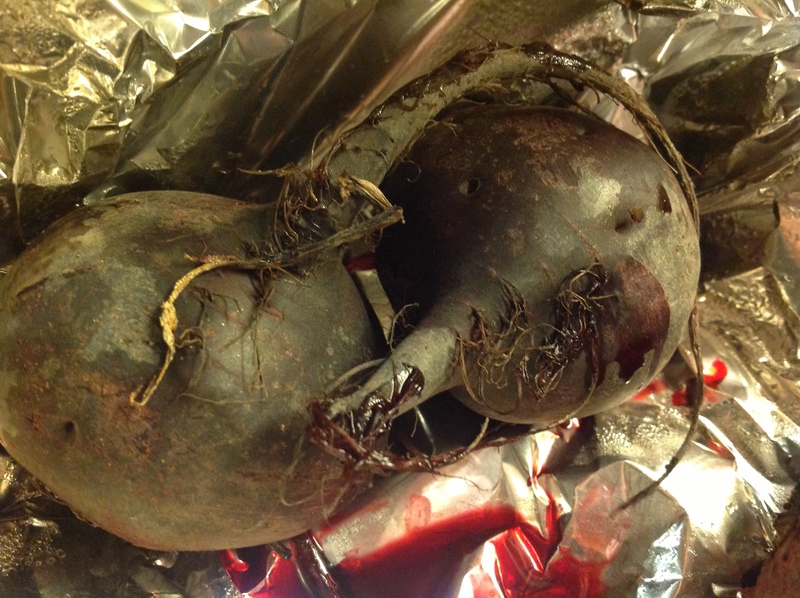 2 medium or 4 small beets, preferably a mix of golden and choggia, roasted, peeled, and cut in small dice (preferably smaller than 1/2 inch)–I use whatever beets show up in our CSA box or garden. Make the dressing. Whisk together the vinegars, salt, mustard, and garlic. Whisk in the oil. Set aside. In a large bowl, combine beets, cooked quinoa, walnuts, bail, feta, and greens. Toss the salad with the dressing. Grind pepper on top. Martha Rose’s exact recipe, including her yield, advance prep advice, and nutritional information per serving is at “Beets Raw and Cooked”.